Do you believe in the ageing of dry white wines? I have always been very sceptical about it. Generally there are only a few (non-sweet) white wines which are known to have a good ageing potential. These are Chablis (Chardonnay) or other white Burgundies like Montrachet’s for example, and of course Rieslings’. If a Riesling has an optimal balance between fruitiness/sweetness and acidity it can pracitcally age forever and if it has as an extra, minerality and complexity, it might become a fabulous treasure! Well this is at least the theory. Of course, as a German I have so far mostly been confronted to old Rieslings. And practically when I think of them, I have an image on my mind of some brown liquid which I pour into the kitchen sink. Thus my belief until that day was that stories about good aged Rieslings were myths. But today I should learn that I only drank the „wrong“ old Rieslings. I was in fact too much impressed by the collection of third quality bottles my parents had accumulated over the years, which were something like „Riesling Kabinett 1978“ from some remote vineyard. With the bottle I opened today, I learned that if you ever tempt to drink an old Riesling, you have to chose at least a Spätlese from a decent vintage (1959,1964,1967,1971,1976 or 1985 for example), and a reknown „Lage“ (vineyard). So what was that bottle that made me change my mind? Was it a German Grand Cru or something? No it wasn’t! It was simply a late harvest from a remote vineyard but made in a great vintage. Indeed, 1976 was apparently a very hot year, and this heat has translated itself into wonderful fruity white wines, of which the best bottles are still drinkable today. This 1976 Luginsland from Weingut Peter in Wachenheim we opened, had a golden and amber colour with brilliant clarity and some slight orange reflects. Its nose was heavily perfumed with honey and a clear, elegant age note (Edelfirne in German. Is there anyone who could tell me how to translate Edelfirne properly into English?). On the palate it was oily and rich in texture, with a slight exotic impression. There was still some acidity and a fresh minty note which gave the wine a youthfull appeal. The final was extremly long and had a slight bitternote, which didn’t alter the overall impression which was very good: 90 points. And I was really impressed. 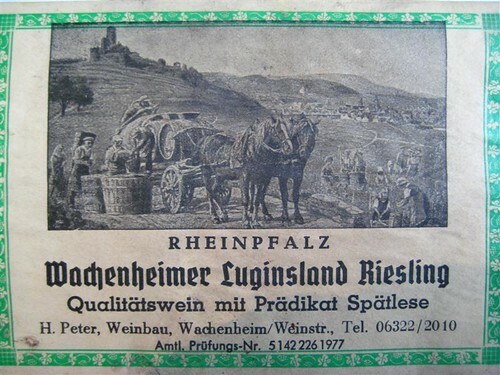 Now my question isn’t anymore: can old Riesling taste good? It’s rather: if a Spätlese from a remote vineyard tastes good, how good must a Spätlese, Auslese or a Goldkapsel from a top vineyard taste? And thus I am now very eager to get more out of aged Rieslings and prepare myself for a real tasting session, but merely from top vineyards and top vintages, trying to find some real treasuries.